Spring has come at last and summer is around the corner in Northern Colorado, so the time is ripe to make sure your backyard deck is ready for the warmer months. And if you don’t have a deck, that’s where a Fort Collins deck installation expert team can help you turn your outdoor areas into a prime hangout. For your existing deck, where should you begin? Getting your deck and outdoor areas “ready” is primarily concerned with making sure your outdoor furniture is undamaged and able to withstand another season, ensuring the deck itself will be durable enough to host guests, and tidying up your outdoor spaces. The overarching theme of deck prep is you and your guests’ comfort. Going over your equipment (i.e. grills, outdoor lighting, fire pits, etc.) will help you make plans for when the weather gets hot and clue you in on which types of events you can host at your home. Look for signs of rot such as soft spots, discoloration, the splintering of the wood, and loose boards. Do a thorough inspection of your deck surface to find and replace all or part of the wooden boards that are rotten. You can always hire a trusted deck installation company to do necessary updates to maintain your deck’s safety. If you’re still looking for new deck installation, you won’t have to worry about rot right away. Consider which materials you’re using for your deck. Pressure-treated pine wood, for example, isn’t as susceptible to rot as a natural redwood deck. Before you do anything else, clean your backyard deck. Go through whatever clutter you have on your deck and wash the surface. If you have a wooden deck, power wash in cooler months to avoid putting stress on your deck wood. After you’ve washed your wooden surface, consider re-staining the deck if it looks like the protective layer has flaked or been damaged since last summer. If you have a deck made from faux-wood or most other materials, you won’t have to worry about staining. For more deck clean-up steps, click here. Adding a splash of color is a great way to spruce up your deck for a new season. Rather than painting the deck itself, restrict your painting to deck chairs, furniture, etc. A fresh coat of paint on your deck chairs will make them look good as new. Another addition that is sure to bring any backyard deck party to life is outdoor lighting. Depending on your property, bringing lights to your deck could be as easy as running an extension cord outside. For more elaborate light set-ups, you’ll need to install power outlets or lines to your deck. For more on color and lighting, click here. Summers in Northern Colorado can be hot, and the sun is intense at this elevation. Consider where and how to place shady areas throughout your outdoor areas. There are, of course, infinite ways to create shade, but the most popular are wide umbrellas (which can be moved and placed in other sunny spots as needed), canopies, or curtains. Curtains work well on roofed patios to keep the inside cooler and the insects out. For a more permanent option, consider having your deck installers add on a shaded area to your deck. Another consideration that might be difficult to visualize in winter is the use of plants to add decoration and function to your outdoor gatherings. Planting fragrant and colorful flowers is sure to wow your guests and add a sense of comfort to your cookout. Plants can also be used to repel pesky insects like mosquitoes. The best plants to keep mosquitoes away are marigolds, lavender, and catnip (although you might replace your mosquito problem with a cat problem). Cleaning, repairing, and setting up your deck will ensure that your outdoor parties have the perfect setting all summer. Adding a deck is an investment that pays for itself in entertainment and outdoor comfort for years to come. If you’re thinking of adding a brand-new deck to your home, consider contacting Altitude Fence and Deck, Fort Collins deck installation experts who have improved home outdoor areas in Northern Colorado for years. Altitude Fence and Deck has worked with many landlords throughout Northern Colorado looking for custom Fort Collins fences. Our products stand the test of time and can help improve security and property values. If you’re a landlord, property decisions are much more complicated than if you were only a private homeowner and resident. You’re not only responsible for your own property; you’re responsible for marketing that property to the right renters and then maintaining that property for your tenants. There is of course no end to the improvements you can do to your property, and there’s no end to the requests for better facilities and repairs, too. When looking for fencing options for rental properties, there are many options to consider, and many factors that private property owners and residents don’t have to deal with. Landlords are in a unique position. They’re at once maintenance foremen and women, marketers, sales people, and friendly neighbors. They have to collect rent and improve their properties so they can gain more from their rental investments. For all property owners, installing a fence is an investment in their future security and property value. For landlords, they must also impress current and would-be tenants. 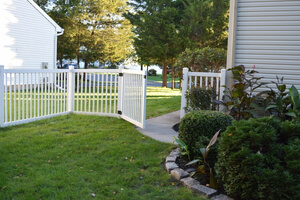 Even though it’s the landlord’s investment, new custom fences benefit the tenants. What should you consider before investing in a new fence for your rental property? For your own home, wood can be the perfect fencing material. You can use a variety of elegant styles and types of wood to achieve just the perfect look for your outdoor space. However, wooden fences require more maintenance than other fences (read more on fencing material considerations here). Ornamental aluminum fencing can make any property look more upscale, and it’s easy to maintain. You don’t have to worry about your fence rotting or fading in the hot sun. Aluminum won’t rust or color in the snow and ice of winter, and it won’t warp in summer. Fixing aluminum fences is usually easier than fixing wooden ones. Another option is PVC fencing. Although this material isn’t as elegant as aluminum, it’s as durable, low-maintenance, and cost-effective as aluminum fencing. Aluminum and PVC are usually the most cost-effective materials you can rely on to protect your rental property and add value to it. But there are other materials that have their benefits as well. Wrought iron fencing is more expensive, but the security this material provides is unparalleled. Iron fences won’t break down over time, either, and require minimal maintenance. Vinyl fencing is easy to install, easy to clean and care for, and customizable with many different colors and styles, but it’s also on the more expensive end of the scale. To read about other fencing materials, click here. There are more factors that you don’t control when you’re a landlord trying to make improvements to your property. Notifying your tenants and getting them to keep themselves and their pets away from the installation crews might be a challenge in some cases, although, your tenants might be enthusiastic about the work, especially if they’ve complained to you about the need for a fence. The main issue with installation, other than the work itself, is the scheduling and safety concerns. Make sure your tenants know when and where the fence will be installed so they know to steer clear. If you’re installing a fence in part because of dogs, make sure your tenants know to keep their pets out of harm’s way, too. You may find that the best time to install a fence, if possible, is between tenants. Landlords and regular homeowners alike invest in fences because they not only add security, they add a bit of elegance and beauty to your outdoor space. Invite your tenants to put flower planters next to the fence, or to dress up the gate. Add some of your own easily maintainable landscaping touches like flower beds or garlands to the fence after it’s installed to make your property even more attractive to tenants. You could make the gate the grand entrance with some natural décor. 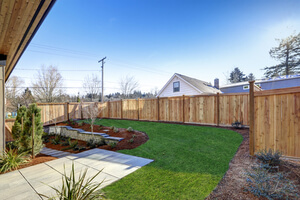 These considerations will get you started on your fencing project for your tenants. If you decide to install a fence, consider Altitude Fence and Deck for top quality services and results. Do-it-yourself projects around your home are very often rewarding and cost-effective ways to improve your property. However, as Fort Collins residential fences experts can tell you, there’s plenty that can go wrong when installing your own fence that can cause you to go over budget and spend entirely too much time on a less-than-satisfactory product. This is not to discourage you from attempting home improvement projects around the house or disrespect your DIY prowess. There are certainly numerous projects that could bring about just the end result you want. But as a homeowner, you need to be aware of what could go wrong in a fencing DIY project, and why you should consider hiring professionals to at least help you with the job. Before you start your next fencing project, with professional help or otherwise, you should consider a few things. First, know why you want a fence in the first place. Do you value your privacy? Are you near a busy street and want to cut down on traffic noise? Do you have small children or pets who might wander off when playing outside? Determining the reasons behind your fence will help you make other decisions about fencing materials, height, and length. Check out this article on choosing your fence. You should also consider the maintenance work you’ll be doing on your fence once it’s completed. The prototypical white picket fence is usually made of wood, which requires more maintenance than other materials because the slats and posts can warp and rot over time if not properly maintained. After you know what you’re getting yourself into and what you want, consider hiring Fort Collins residential fences experts. The first reason stems from a common misconception by DIY fencers. Many DIY-ers swear by their obsession with hand tools and paint because they believe it’s cheaper to complete home projects (like installing a fence) themselves than hiring professionals. While it’s certainly possible to build your fence for less than a professional would do it, you almost certainly need experience in this work to complete it will at a cheaper cost. A professional job is much cheaper and faster than an inexperienced fence install. Have you ever tried to draw perfectly straight lines on a field for a pick-up game? Simply building a consistent and straight fence is difficult, let alone digging the post holes and hammering in the fence planks. The right fence installation company will go over the cost with you and help you make the right decision for your budget. The next reason is a simple concept: you can trust the fence will be installed correctly the first time. This ties into the first reason because an improperly installed fence is a quick way to go over-budget. Do your homework and find a quality fence installation team in your area so you can trust them to build your fence correctly. You’ll save yourself money and the headache of wondering if your fence will last and do its job properly. Fencing experts also know the best materials for each scenario. So if you tell them why you want to install your fence where you want it, they’ll suggest the materials that will be the easiest to maintain and will stand up to the fierce northern Colorado winter (and fall, and spring, and summer, for that matter). The last thing you want is a fence that starts to rot at the first sign of moisture. The final main reason for hiring professionals to install your fence is that you can expect easy maintenance once it’s installed. Reputable professionals make it easy for their customers to keep their fences clean and structurally sound. If there’s ever an issue with your fence and you need to have it repaired, you can call up your installers for repair work you can count on. Usually, fencing companies will help you out if something unexpected happens to your fence. Also, since your fence installers used the best-possible materials and their expertise the first time around, you won’t have to worry about premature maintenance tasks. Fencing specialists will also usually discuss the best maintenance tips when you choose your fence and materials. Again, don’t be afraid to try some DIY projects around your home, but fencing is more complicated than it seems. Consider hiring professionals to get a fence guaranteed to last and give you want you want for your property. Have a few questions for a fence company? Contact Altitude Fence today. Installing a new fence is tricky for a number of reasons. Before you set out on your fence installation project, there are several factors you must consider. First, consider hiring reputable fence installation services in Fort Collins to help you make the project go as smoothly as possible and to ensure a beautiful final result. Whether you decide to handle your fence installation project on your own or rely on the services of a skilled, professional fencing company, here are some of the most common factors you should consider before getting started. 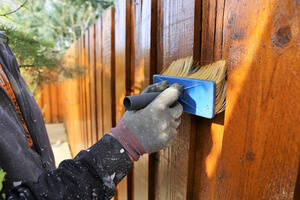 If you are tackling the project on your own, consider staining your fence or applying clear wood preservatives. Depending on what your fence manufacturer has applied to the fence, you can stain or finish your fence before you put it up. Some fences are treated by the manufacturer, which in some cases can prevent your stain from setting if you try to stain it yourself. No matter what you apply to your fence, make sure to let it dry completely before handling it. Most people undersize the hinges on which the gate sits when they try to build their own fences. Gate posts must be set deeper in the ground and more cement has to be poured around them. Make sure that your hinges and posts are able to hold the gate properly. Sometimes nasty-looking fences can cause bad blood between neighbors. Remember that your neighbors and friends will be seeing the outside of the fence, so make sure that it gives off the positive impression you are hoping to give. If your fence has a decidedly more ‘functional’ side that contrasts from the pretty side, be careful to face the pretty side out. From start to finish, make sure you’re paying attention to your fence calculations so that it goes up evenly as you’ve intended. Most property codes around the United States have stipulations for fence installation and property modifications that you must follow. The city of Fort Collins, for example, has fencing regulations that can be found here. In Fort Collins and most other jurisdictions in Northern Colorado, you don’t need a building permit to install a fence less than six feet tall. Anything taller than six feet requires a permit, and front, side, and rear yard building setbacks. Usually, if you live in a residential area, you’re free and clear to build a fence, but there could be zoning requirements in play. It’s better to know for sure from the start instead of having to work things out after your fence is already installed. Check your zoning regulations before you begin. Different jurisdictions may have different overall standards for fences. In Fort Collins, fences can’t be higher than four feet between the front building line and the front property line. This is only the start of your fence installation project. Remember that it is key that you fully understand any regulations you must follow so that you don’t have to tear down a fence that’s already been installed and start over. A professional fencing company can help make your fence installation project as easy as possible. Professionals have the skills and proper tools to complete the job efficiently and beautifully. A local company is usually also going to be quite familiar with the regulations, permits, and standards you will have to meet. Ready to hire professional fence installation services in Fort Collins? Contact Altitude Fence and Deck today. Fort Collins fences have to stand up to more abuse than fences in many other areas of the country because of the unpredictable weather. 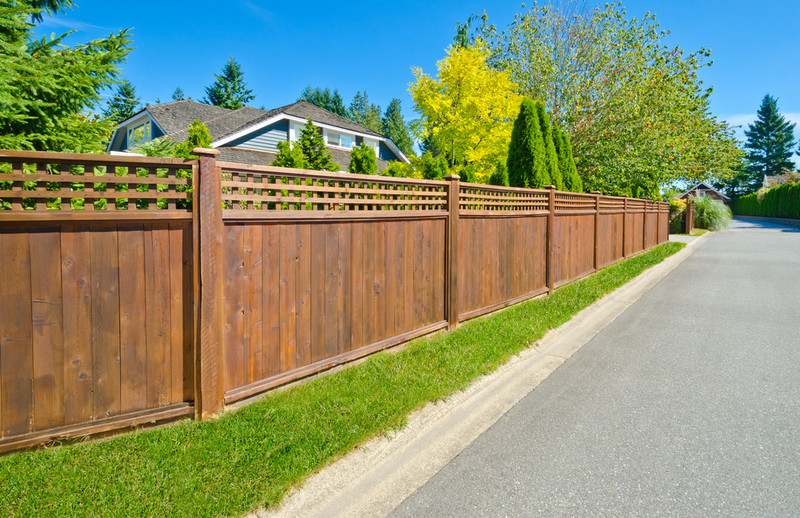 Refinishing wood fences helps protect their materials from being damaged by moisture and cold in the winter, and from intense sunshine in the summer. Stains protect yet flaunt wood’s natural grain and pattern, but they need to be re-layered every season or so to keep doing what they’re designed to do. Pressure wash your fence for the fastest results. If you pressure wash, make sure you protect yourself with gloves and goggles. Debris coming off the fence can sometimes get in your eyes. Also, be careful not to damage your fence with too much water pressure. Clearing the fence’s surface of debris will prevent you from staining dirt and grit onto the fence permanently. After you’ve washed your fence, you’ll need to let it dry for at least 24 hours before refinishing it. Pay attention to the weather as well. If storms are threatening, or if the air is otherwise humid, wait an additional 24 hours before applying stain. Another pro tip is to repair all cracks in the wood with wood glue before applying the stain. If you have a large, long fence, it’s best to treat it like you would a painting project. Use a roller set aside only for staining that covers large areas quickly and evenly. The best roller for oil-based stains is a medium nap roller. Go back after using the roller and touch up the edges and small missed spots with a brush. After you’re done with your first coat, wait at least an hour before applying the second. Many fence owners like to stain and re-stain the wood multiple times to ensure full protection and enhanced stain color. Letting the stain sit will allow it to penetrate the wood and protect its natural beauty. Typically, one coat is enough, but many homeowners find themselves unsatisfied with the color after only one coat. The final tip is to apply a wood sealer or “wash coat” to the wood when you’re satisfied with the stain coverage and color. Wait 72 hours after you apply the final coat of stain or refinisher to the fence before you paint on the wood sealer. Wood sealer dries fast, so work quickly. Try to apply the sealer in long, even strokes. This seals off the wood’s pores and gives the finished fence a glossy appearance. Staining your fence for protection against outdoor exposure is a good idea to keep it from succumbing to rot and other damage. Remember, you want to showcase the natural beauty of the wood with your stain, so take your time and make sure you get an even coat all the way around. For additional tips on how to care for your wood fence, click here. Is your fence past the point of repair? If you are looking for a trusted company to install a new fence for your residential home in the Fort Collins area, contact us today. Installing a wood fence requires energy and time, but it is frequently worth it as you can have privacy without detracting from the appearance of your landscape. Even if you do not develop a high fence, a wood fence around your yard can avoid unwanted animals (like pets) from entering into your lawn. Before you take on the project of building a wood fence, there are a couple of things to consider when it comes to preparation and executing your plan. Understand your property bounds. The last thing you want to do is upset the neighbors. Understand the fencing options that are available. Your fence should be aesthetically pleasing, as well as functional. When building a wood fence, it’s important to consider the aesthetics of the completed fence. While some designs have posts extend above the top of the fence for ornamental functions, some fences are only as high as the posts. Another type of design is an open fence design that does not use panels. Instead, this design utilizes latticework, or even straight boards are the primary components that provide personal privacy. If you would like your installation to go smoothly, you preparation is key. Understanding the priority and sequence of installing your fence is key. This cannot be overstated enough. Be sure that you have a strategy for your fence, based upon the preparation discussed above. Know where you are going to position your posts ahead of time, and have a concept of how high you want your fences. If you have properly prepared your fence, then you will be able to finish it that much quicker. As soon as you have your posts in place, you are all set to construct a fence. Follow the strategy thoroughly, and try to adhere to your budget plan. When you have everything correctly prepared ahead of time, you will be amazed to recognize how quick the work goes, and how great your fence looks like an intended part of your landscape. While chain link fences are used in some landscapes, a lot of people prefer to make use of wooden fences when constructing an attractive view. Even if the fence you’re building isn’t very tall, a wood fence around your yard can avoid unwanted animals (like dogs) from getting into your backyard. These are the aspects that nearly every fence consists of, and are almost generally needed to develop a reliable and appealing wooden fence.